Rice & Curry all day every day!! While visiting a new country is interesting and exciting, moving to one, learning to adapt, and understanding the culture can be challenging. Some things are very obvious and easy to get used to, while there are certain other things… well, you’ll probably never get used to them. 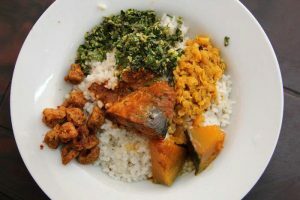 Here’s one that is very typical for ‪Sri Lanka‬, but can be difficult to a foreigner. Sri Lankans do love their rice and curry. So much so that they prefer to eat it at every single meal, and if that wasn’t crazy enough, they put enough spices in it to kill a small animal. Jokes aside, Sri Lankan food is exotic, bursting with flavours and overall really good. But let’s face it, eating rice and meat in a spicy gravy for breakfast is never going to feel normal to a Westerner.